2. After that you can see the project list, which gives you a short overview about all your projects. 3. The management form will open. Here you can enter the basic project information. The project number is automatically generated. But administrators can customize the project number and the number format in the InLoox options. Choose the responsible division and a category for your project. Administrators can customize the division structure as well as the project categories in the InLoox options. To assign a picture to your project click on the grey InLoox Logo. Locate the picture you want to add and double-click on it. 4. 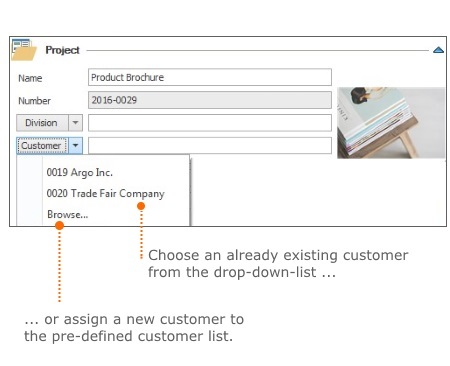 Assign a customer to your project. 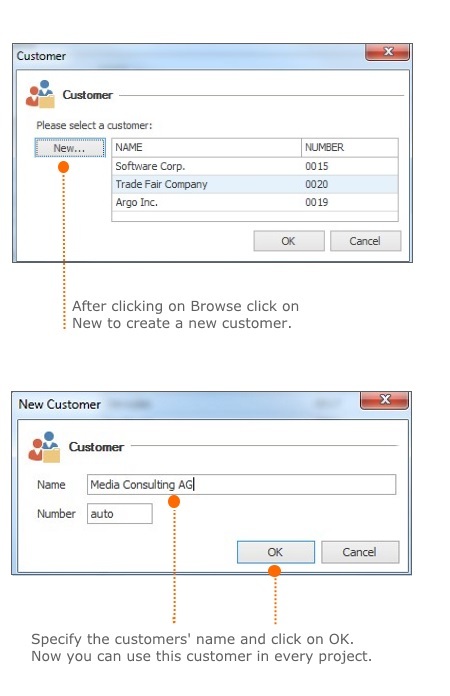 Additionally, administrators can edit customers and customer numbers in the InLoox options. 5. By assigning project team members (project team, project partners, customers etc.) to the project, your employees will know for which part of the project they are responsible. Moreover by assigning project roles, you define the role permissions of the chosen person. Select one or more project managers by double-clicking on the entry and click on OK. Select one or more team members by double-clicking on the entry and click on OK.
6. Select start and end dates as well as the status of the project. Status: Administrators can individually define the project status in the InLoox Options. 7. 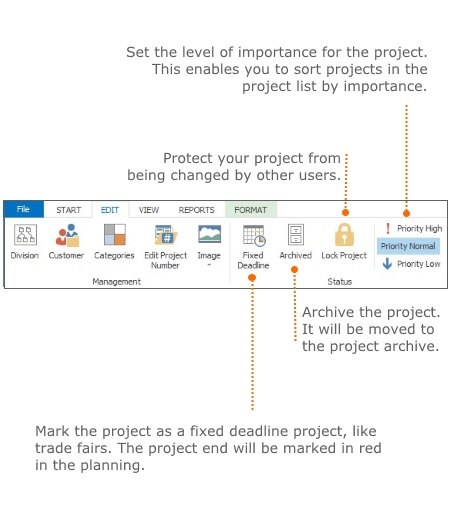 Use notes to leave any additional information on the project. 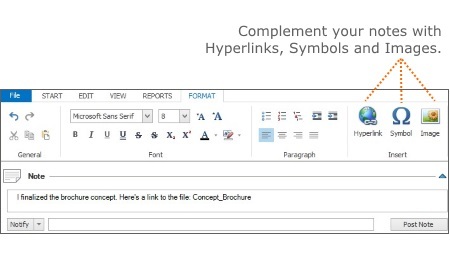 Hyperlink: If you want to link a file, website or picture, mark the relevant part of your note and click on Hyperlink. Select the file in the address field or enter the URL of a website. Then click on OK.
Symbol: Choose a symbol, which is not on your keyboard or is a special character. Picture: Browse the folder where the picture you want to add is saved, select the picture and click on Insert. You can resize the picture directly in the note. 8. To save your note click on Post Note. Your file is now linked to the note and can be accessed by pushing the Ctrl-button and clicking on the link. 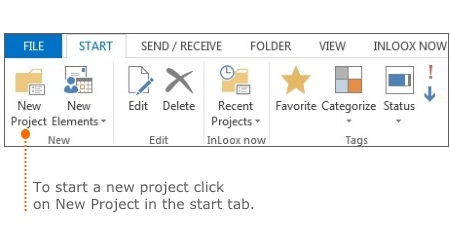 Additionally, you can send your note via email to the project manager or other team members. Click on Notify and select a contact from the address book. 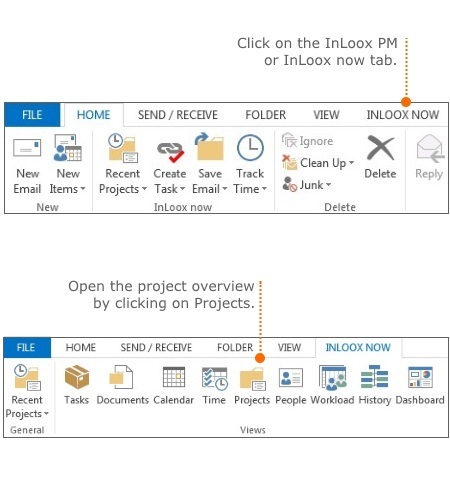 Notify: Administrators can define in the InLoox options, if notes are send via email, as Outlook-tasks or as Outlook meeting requests. 10. Click on Save and Close in the start ribbon when you are finished. How to create a new project • Copyright 1999-2019 © InLoox, Inc. All rights reserved.